Home > Why is VirtualBox only showing 32 bit guest versions on my 64 bit host OS? Why is VirtualBox only showing 32 bit guest versions on my 64 bit host OS? I experienced an extremely nettlesome problem after swapping out my traditional hard drive for a faster Solid State Drive (SSD). I installed Windows 8.1 from scratch using the Product Key, copied over all my software (I probably should have used Ninite but I was too lazy) and then mindlessly enabled a bunch of options that I never enabled before. But Alas! Stupidity has a cost and in my case it cost hours of discomfiting nights scouring Google for a solution. Today I want to save you the pain I encountered by showing you how to fix a problem I experienced in VirtualBox. This post is going to be succinct and to the point. Even though my Host OS is a 64-bit version of Windows 8.1, VirtualBox categorically refused to display any 64-bit guest OSes in the Create Virtual Machine dialog box. This was super annoying because all my ISOs were 64-bit therefore I couldn’t use them until I fixed this problem. Uninstalling and reinstalling VirtualBox made no observable difference so I booted into the BIOS to see what I could find there. I have a Lenovo ThinkPad W520. As a side note, a few months ago I made another idiotic mistake: I enabled a bunch of BIOS passwords to make myself feel secure but then forgot how to disable them! Thank God I didn’t enable a Supervisor Password or else I would have to replace the system board. That’s seriously the only way to get around that one; resetting the CMOS won’t fix a forgotten Supervisor password. Thankfully, I remembered, the Hard Drive password and the Power-On Password, so after surmounting those obstacles, I removed those passwords and tried to see if there was anything I could enable to make VirtualBox display 64-bit Guest OS versions. In the Security Section, I noticed an option called Virtualization. Filled with a bracing hope, I tabbed over and hit enter but then noticed all relevant settings were already enabled! Intel (R) Virtualization Technology was enabled and Intel (R) VT-d Feature was also enabled. These were two key options that VirtualBox was expecting. But since both were already enabled I was utterly flumoxed. Do I need to toggle the values? In other words, do I need to disable both options, save changes, reboot, and then enable them again? I couldn’t figure it out so I decided to poke around the administrator options in Windows to see what I could find. I wanted to see what administrative Windows features were enabled – perhaps something was conflicting with the visualization settings in the BIOS? In Windows 8.1 Hyper-V is the successor to Microsoft Virtual PC. It’s the native virtualization component that is available to all Windows 8.1 users. Interesting. Could this be conflicting with the Intel settings in my BIOS? I decided to uncheck the option to see. Windows quickly displayed a progress bar denoting the removal of the Hyper-V platform and after about a minute prompted me to reboot. I couldn’t have been more elated – something like this might seem trivial to some people but it was really worrying me. Because it used to work before I upgraded my hard drive. It turns out, upgrading my hard drive wasn’t even remotely causally related to my problem. I think I literally pumped my fists in the air when I saw this screen. I hope this helps you – I don’t know if my situation will apply to your system configuration but I wanted to share. Hopefully this little article will spare you the hours of mind numbing frustration that besieged me for the last few weeks. Nice stuff overall, After some days ago, I was need to install latest Operating system windows 8.1 pro at my notebook, So I install with it from my DVD suit, But with getting its activation, I saw product key was lost. Where I bought, Which is working well now. I was struck with this same problem with 1.21 Giga Watts! It worked for me too.. Thanks a lot! I suspected the same thing about maybe Windows masking the 64 bit option. Sure enough you’re research made it so much quicker to figure out. Thanks for the research … saved a bunch of time. You are my HERO FOR THE DAY! (Week!?) Seriously, saved me hours of work. Thanks! I use the “uppest” comment so everybody knows this: I had the same issue in Win10 today. Windows Defender has an option “core isolation”. I somehow had this enabled recently. Disabling it solved the issue and I now can use VirtualBox with 64bit guests again. Thanks to the threader and all the commenters that pointed in the right direction! Also enabled core isolation and tray to all way to slowed problem with VritualBox. Disable after run again properly. I had this same problem but when I check the things you mentioned they were all set correctly. I enabled and disabled VT-d in the BIOS, saved changes, and restarted and then it worked. Or maybe it was the restart… it works now. It was most probably the restart that solved your issue, if you installed a fresh copy of VirtualBox. For some reason, VirtualBox requires this on some PC’s, whereas with VMware Workstation it works without restarting the computer. Thanks bro! You saved a lot of my time! Thanks! I’m just on Windows 7, but this helped with the bios image. Most HP pavillion lap top computers ONLY require to enable in BIOS virtualization in the BIOS setup by entering in to the BIOS setup by post boot pressing Esc + F10. Myyyyyy hero! This saved me a bunch of time, thanks!! You sir are the shiz. Solved the problem although it was an amd processor in my case. I am not getting any feature as Hyper-V in that box. Please Help!! 2) Windows 8 (Pro/Enterprise editions only) and newer. Windows 7 or older did not come with Hyper-V unfortunately, so if you still have this issue it must be something other than Hyper-V. Since I was running Windows 7, that pretty much instantly ruled out Hyper-V as a problem and I was also 100% sure that all virtualization settings were enabled in BIOS. Interestingly enough, I just had to restart my laptop and after that VirtualBox showed all the versions correctly (now even the 64-bit). I forgot to restart my computer after installing VirtualBox. =) Pretty typical of Windows. Thank you so much! That’s exactly the problem and this article is so helpful!!! Im assuming this trouble shooting will work with windows 7 or 8. Any other tip would be mostly welcome. Thank you. :O this totally works. All it took for me was to choose the repair options and then that was it. Thanks John! How do you open the installer you used to initially get virtualbox? Wow thanks. Such a stupid thing to need to do but totally fixed the issue. Though you don’t need to restart or get a new shortcut only run repair. Thank you John and Alejandro, that worked just fine!! Cant believe it was that simple, thank you! Same here, seems too simple to be true but it worked like a charm, without even restarting, thanks ! install >> repair >> done. I’ve been trying for the past week to see my 64 bit versions of kali. You’re my based god. how do i get to that install >> repair option? Right click on the Virtualbox install file >> “Run as Administrator” >> “Yes” >> Repair, then follow prompts. Thank you man . It really worked for me !! Unfortunately, this works! I hate solutions that have no reason but thanks so so much! Hey dude, i did exactly the same way you did, but it did not work///: I have windwos 10. i could not fixed the problem unfortunatelly. please help? Same problem, it didnt work for me.. repair>restart>run the virtualbox from c:programs..
worked as well on a windows 7 ultimate host. Works like a champ win10 ent x64. please help me Im using this for my college class and it is very important. Thanks! You saved me a lot of time. Thank you so much. Been trying to install a Yomsemite VM for a little while but this worked beautifully. You are fantastic. I uninstalled, reinstalled, check BIOS, verified HyperV was already disabled (it was), then hit my head against the wall 3 times. Found this, repaired my install, even though it was freshly installed, and fixed the issue. Now I can get my SBS2011/Win Server 2008 R2 lab going! SAME, AND the repair doesn’t work unless I reboot. It’s been a while, but I managed to fix this. Now that I’ve been using Hyper-V, I actually prefer it (and it’s necessary to learn if you plan on taking the MCSA Server 2012/2016). Verify that your processor virtualization flag is on in the BIOS, save and exit for good measure (usually F10), and boot into Windows. Install or use Hyper-V and your life will get better. Let me know if you have problems and I’ll help troubleshoot. So I turn VT on again and it works fine now. Thanks! Glad to hear it. Same thing happened to me on my last system. I’ve since built a server and moved on to a real lab. I didn’t need to reboot my system .. it works just after repair work done. My HERO!! If you have a Paypal, I would love to donate you!!! What a coincidence. I have the same machine ThinkPad W520 and was facing the same problem. Your article worked for me. Thanks mate. In my case I have a Lenovo ThinkPad (E550) but it has Windows 7 on it. I’ve enabled both the settings in Virtualization in BIOS and it works. your fix worked like a charm. Thanks a million. Thank you!! I spent days trying to figure out this problem. You’re the man! Wanted to tell you all how to do this on a Lenovo ThinkCentre with Intel processor, Windows 7, and disk encryption software. The disk encryption software hijacks the standard boot sequence, so the F1 key doesn’t get you to the BIOS from a cold boot. Instead, boot normally, then run the Repair option from the installer (not sure it’s necessary, but I did it following one of the suggestions below), then do a Restart as suggested by the program). Press F1 to get to the BIOS, ENABLE the Intel Virtualization feature in the Advanced menu, F10 to save the BIOS setting change, and then continue with the normal Boot sequence. @vonnie Thank you so much. I faced the same problem last night on my MSI GE70 Apache Pro Notebook with Windows 10 (x64). Now I am in office and cant try out your tip right away but I know this is definitely the problem because I activated and used Hyper-V for XP just a day ago. I am noob to Virtual Machines and just trying to dive into the pool. I decided to give “Hyper-V” a shot because I thought it is “by Microsoft” so it must be more “fitting” with Windows 10, rather than any third party VM. But when I tried to transfer data between the host and the guest, I literally started to sweat, and finally gave up. Thank you very much for this post. It helped me solve a problem i had for two weeks. Only one thing more to consider. In my case, i checked all this ocnfiguration, but the problem was that my system was with “secure boot” enabled. Maybe one more item to test and add to your checklist. Thank you so much for this! Saved me wasting my Christmas holiday trying to troubleshoot! Thank you! Had a similar problem (64 bit linux version not booting from CD). Windows 10 home edition does not have the hyper-V, but the bios had to be changed. Thank you again. you saved me a lot of head-scratching. danke shoen!!! Thanks. This helped a lot. This is like the most useful post I’ve seen in my life, I’ve lost hours trying to solve this issue! Thanks! Great post. Solved problem in 5 minutes due to your struggle. Hyper-V is not compatible with Virtual Box and VM Ware, afer uninstall Hyper-V my Virtual Box works. It’s working now, thank you. Although I wonder why do I need to disable Hype-v support in Windows 10. Thanks !!! it is now working. Thanks for the tip, I’m going to go and try this now on my Asus laptop as I also can only see 32bit versions. I want to test out Win10, but not ready to upgrade just yet! 1) Windows Feature named “Windows Virtual PC” was Disabled. 2) In the BIOS settings, under System Configuration, “Virtualization Technology” was Enabled. Thx, worked like a charm on Lenovo T440p. Thanks a lot Vonnie. That resolved my issue. I am running Windows 10 trying to install CentOS using Virtualbox. I too couldn’t see 64-bit option. My problem was with the BIOS settings. I had to Google to figure out how to get to those settings because it’s been a while I did that. After turning ON virtualization option in my BIOS, I am now able to see 64-bit options as well. 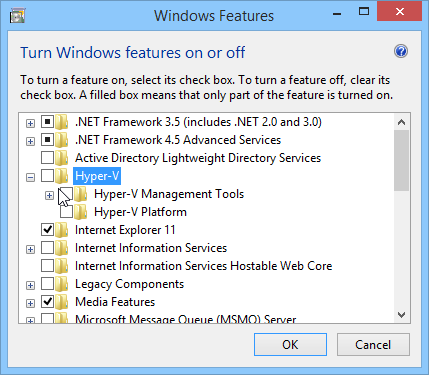 Although, I didn’t see Hyper-V platform options in my Windows features dialog box. Thank You so much.. I’m using Hyper – V but Virtual Box too. Solved for me, thanks! THANK YOU ,it worked for me ! 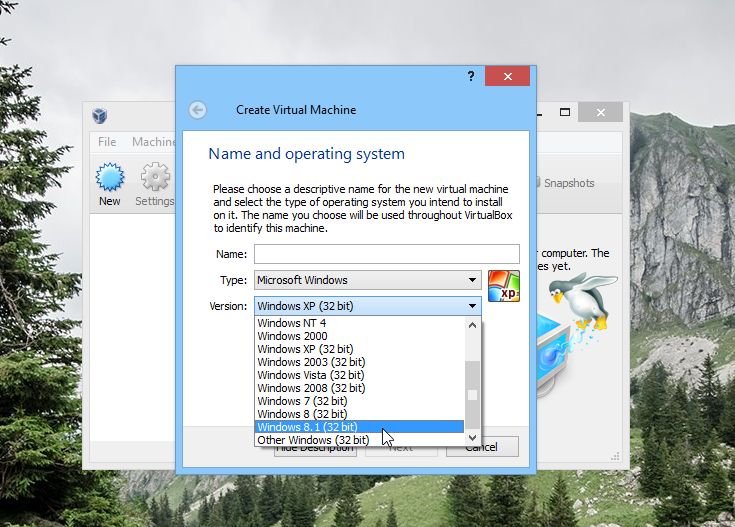 Just wondering why you would want to use virtualbox if you have hyper-v enabled? I have used both in the past, and have recently started experimenting with server OS in hyper-v and they work really well. I have also installed Linux inside hyper-v without a problem. Hey Vonnie — Thank you ever so much!! I couldn’t figure it out either & I didn’t even think to change that. I only needed to change it in Windows, I didn’t need to go into the BIOS. When you enable the ‘virtualization’ setting in the bios, that enables a virtual machine ‘hypervisor’ to see that this computer supports hardware cpu virtualization. ‘VT-d’ extends this to allowing direct use of some kinds of hardware, like the graphics card. Only one hypervisor can use these capabilities at a time. A hypervisor manages how virtual machines use the computer’s cpu and ram. A hypervisor enables hardware-level cpu emulation, which is usually much faster than software emulation. Hyper-V is a hypervisor, used for Microsoft’s own virtual machine software. Virtualbox installs it’s own hypervisor to support 64-bit OS’s. Virtualbox can run 32-bit OS’s in software emulation mode, which is why they showed up. 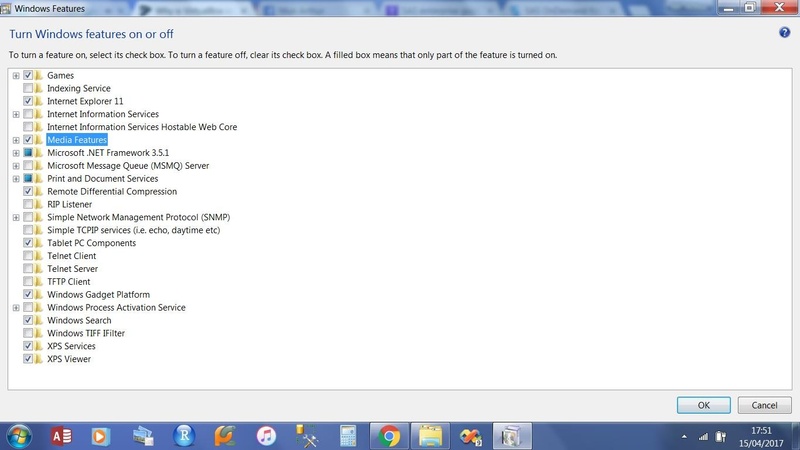 Turning ON the bios settings and OFF hyper-v, makes those capabilities availiable for Virtualbox to see/use them. When installing, Hyper-V had the virtualization capabilities in use by itself, so Virtualbox could not use them. Virtualbox thus did not/could not install it’s hypervisor. Reininstall/Repairing Virtualbox with the settings right and hyper-v off, allowed it to see the virtualization support and install it’s hypervisor. I have virtualization on and Hyper-V completely off yet no 64bit option in VirtualBox. Thoughts on what could be the issue or troubleshooting steps? Same here, on Win 10 Home. Ever get it to work? This is what i needed, THANKS lot! 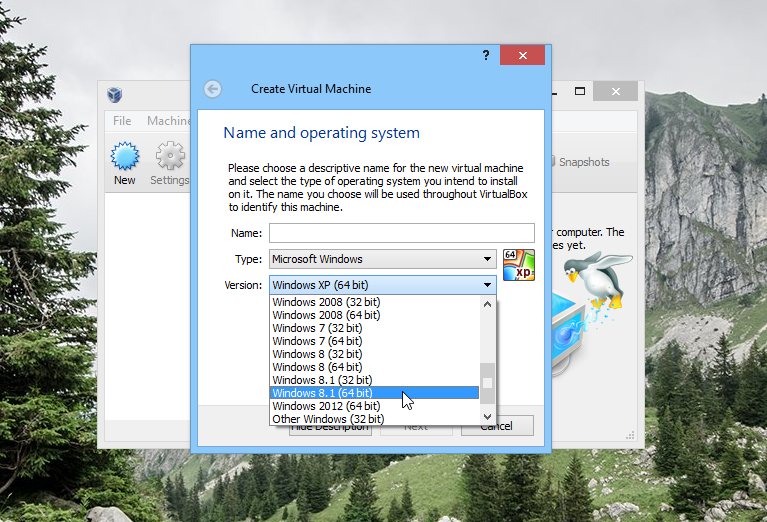 I had to run virtualbox as administrator to get it to show up as no Hyper-V option was available to me. Not sure if that was the issue, but rebooting the machine to clear the currently active programs and immediately setting it to run as administrator by default solved my issue. The intel virtualization technology in the BIOS of your computer must be turned on, not off. Wasted so much time making a 32bit linux, installed a bunch of stuff, cloning git repos, then when I came to Bazel it was “not supported”, turns out it requires 64bit… which I of course would have if it wasn’t for this BS. THANK YOU!!! This totally fixed my issue. Freakin’ HyperV of all things! I use it a work all the time, but I don’t remember it ever conflicting with VirtualBox. the only thing I can attribute it to is that we only run Intel at work. I run AMD at home. This is the first instance of Vbox that I have run on Windows 10 with this motherboard. Every time I started my 64-bit vm of Linux, it would error out. Disabling HyperV did the trick. Thanks again. Thank you so much. This worked for me!! thank you so much man. Worked like a charm. This worked for me on a Thinkpad Yoga 14 bought in 2016 (Windows 10). The Hyper-V platform did not appear in the Windows Feature list, so presumably it was disabled. But Intel Virtualization Technology and VT-d were both disabled in the BIOS (Security tab). After enabling them the 64 bit options appeared in VirtualBox. What about for users of AMD? Lots of reading to get to the fun part. Thanks MilesTFox for the explanation of why things are the way they are. Thanks a lot !!. It worked for me too. For some reason the latest Surface Pro 4 firmware blocked this entirely. I removed Hyper-V and still get BSOD on my old 64bit guests.. no capability to run VMs in VirtualBox at this point. can’t seem to find anyone posting repro issues.. Tried to follow the instructions, but my list under ‘turn windows features on or off’ is completely missing Hyper-V (and some of the others) altogether – How do I fix this? I want to run 64Bit VM’s just like everyone else coming to this topic. My host OS is 8.1 64Bit in this case. Succinct and to the point? This is great, and deservedly at the top of my Google search for this issue. Great article and extremely useful! Disabling Hyper-V worked perfectly for me on my Surface Pro 3, thanks! Nice. For me, it allowed the 64 options simply by enabling Virtualization in Bios. No Windows 7 settings changes were needed. Thank you very much you saved me a lot of hours! Hola! I don’t know what I did (as for some reason my BIOS looks very different from your screenshots), I’m thinking it might’ve been repairing my VirtualBox download, but I got it to work!!! *cue happy dance* Thank you!!! Thank you vonnie! It would be nice if VirtualBox.org posted this fix on their website. I had this same issue and just now I followed what was said and it resolved my issue. If you are having this same issue I would highly recommend that you do check your BIOS and make sure everything that is needed to be enabled for your virtual box is enabled. I am having the same issue ie. my laptop’s operating windows is 64 bit but the VirtualBox only displays those 32 bits. I am unaware to see Hyper – V in the turn on or off Window features. On a Windows 7 host, I fixed the issue just by re-running the installer and selecting the repair option. I have older BIOS (2011) and there is only one setting for Virtualization technology, which was enabled and Virtual Box showed only 32 bit option. When I disabled virtualization setting in BIOS, Virtual Box now offers 64bit! Mine too, VirtualBox has been showing only 32-bit ones, rather than 64 bit. And attempting to start them results in the “SYSTEM_SERVICE_EXCEPTION” BSOD. Great! The reason has been found. Thank you! Thanks a lot, worked ok ! I also checked the Hyper-V. It was disabled. in windows 7 i have no Hyper_v, what should i see else? It`s so counter intuitive! Thanks for posting about this! Really helped me. Thank you – helped me out 🙂 +1 internets…. Hell yeah! I was stuck with the same issue. Checked my BIOS and, sure enough, virtualization settings were not set as they should be. I changed those and VOILA! 64-bit OS enabled in VirtualBox. Thank you! Thanks alot man, worked just fine for me (Intel Virtualization was disabled in the BIOS). Brilliant! Can’t thank you enough!!! 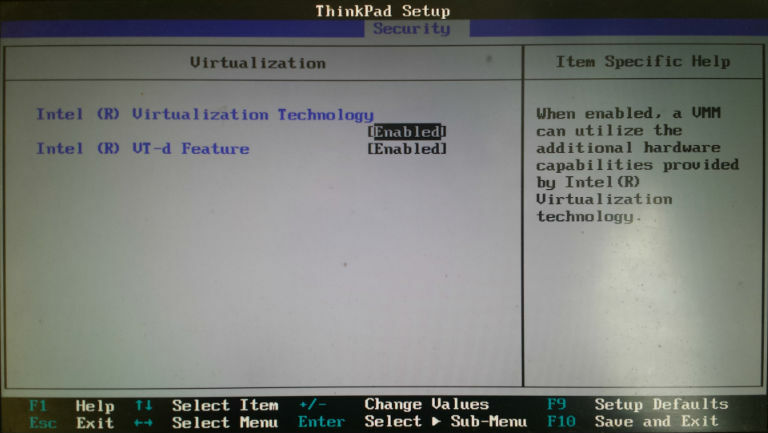 (Solution worked on Thinkpad T420 once the virtualization features were enabled in Thinkpad Setup). Thank you for this, saved me quite a lot of time! It was Hyper-V which I used before and was still enabled. As I have imported a 64-Bit VM guest and when I tried to start it, my host system ended up in a bluescreen. When I tried to create a new VM, I recognized that there was no option to create a 64-Bit VM. Now, with Hyper-V beeing disabled, everything works as expected. That worked wonderfully for me, thanks! Thank you so freaking much ! It worked for me.. saved me a lot of digging around. I went through all the options with no success on Win 10 (Bios options on, hypervisor definitely off, virtual box installed & repaired with Admin). Finally it was DeviceGuard. I went into the registry and turned EnableVirtualizationBasedSecurity from 1 to 0 and restarted. Then my virtualBox started showing 64 bit items and my 64 bit VM’s worked! Hope it helps somebody! I’m having a similar issue on Dell Optiplex 3040 PC (Win10 x64 OS). Have deleted VirtualBox, reinstalled, repaired etc – no luck. Have changed virtualisation settings in BIOS (everything enabled) – no luck. Windows features -> Hyper V (disabled) – no luck. Hi guys, Im facing the same situation. 🙁 any help would be appreciated.. Thank you for the help, I was having the same issue here, and now it’s working fine. I neither have hyper-v nor virtualization in my dell laptop. Note I had to also disable the Windows Hypervisor Platform feature before 64 bit guests were available again. I had VirtualBox installed, decided to try Hyper-V for my use case, then switched back on Windows 10 Professional. what about windows 7 x64, no Hyper V in features ,so how can i solve the issue with vbox x32 version only to x64? Intel Virtualization Technology was disabled in BIOS. When I enabled – it started to show 64-bit section, thanks for the article. My Laptap have dell latitude 5580 model with OS 10 and i installed oracle vm virtual box and enable all Intel (R) Virtualization Technology was enabled and Intel (R) VT-d Feature was also enabled. it’s showing 32 bit only not showing 64 bit. please help. FINALLY!! Thank you!!! Worked perfectly. Thank you so much, i disabled my Hyper-V and it work!! And I can’t find HyperX. What is this? A 32-bit Windows 10 or something? It all started when MYOB wouldn’t work with Win 10. I turned to Virtual Box for Win 7 but only had 64 bit disk and Virtual box was only 32bit. Spent the day trying to get hold of a Win 7 32 bit disk but when I did I had no valid code. When I read your fix I was dubious, changed the AMD to enable in the bios, Hyper-V was already disabled, and your fix is awesome! Wish I had read it at 10am instead of 6:30pm. Thank you, thank you, thank you. Thanks for sharing this! I literally pumped my fists in the air when I found this post! What do you mean by this? I have the problem that my Hyper-V is UNchecked already. So I suspect something else is maybe still running, though. for me i can’t get it to work if only uncheck Hyper-V, i must also uncheck the Windows Hypervisor Platform. virtualizationn in bios was my issue .. I enable vtx virtualization and voila..! Thank you very much! In my case BIOS’s options in `Virtualization` tab had been set to `DISABLED`. thank you man! you save the day!